Feldhemd-Langarm US-orig. Vietnam. 50% Baumwolle/50% Polyester (Teilw. Etikett-innen: "shirt, man‘s, utility, poly/ cotton durable press OG-507 od. 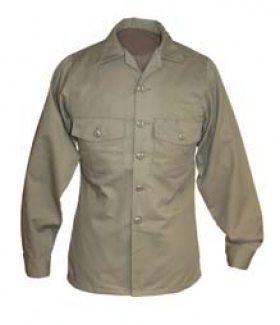 "shirt, utility, durable press army shade 507 50% polyester 50% cotton"). Fatique. 2x Brusttasche. Anmerkung: Orig. US-Army Ausführung !